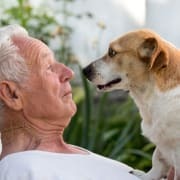 VITAS invites friendly and well-behaved pets and their owners to join the Paw Pals program, in which animals and their humans learn how to visit patients at the end of life. A VITAS Paw Pals visitor can offer comfort, bring back memories, encourage activity and provide unconditional love to VITAS patients. Your visits leave behind memories of you and your pet, and rekindle thoughts of other pets. All kinds of pets are invited to join VITAS' Paw Pals Club. Paw Pals must be well-groomed, at least one year old, and have up-to-date health records.